Who's funding the US cannabis industry? Webb Garrison wants to start his own cannabis business. He doesn't have any industry experience and he's only just building up his knowledge of the complicated regulations that govern the sector. What he does have is a ready investor - his mum. To get a better handle on the industry Webb and his mother Betty Garrison travelled for over an hour from their home on Long Island to the Cannabis World Congress in New York City. 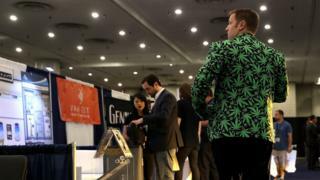 They hoped visiting the booths and attending the conference's talks would highlight the industry's opportunities and hurdles - even if the products they hoped to sell were noticeably absent because of cannabis restrictions in New York. Finding funding is one of the biggest challenges for the industry, which still exists in a legal grey area. Cannabis has been legalised for either medical or recreational purposes in 25 states, but remains illegal on the national level. For most companies raising enough money to start a business is one of the biggest hurdles. Despite the $5bn (£3.5bn) in legal sales in 2015 and the millions of investments already made, funding can't keep up with demand. Part of the reason for this is institutional investors such as pension funds are barred either by law or policy from investing in federally illegal industries. And big corporations have been waiting to see how local and state laws shake out. Last week, Microsoft became the first major company to announce its participation in the sector. The computer giant has partnered with Kind Financial, which helps businesses and government agencies track sales of legalised marijuana. The lack of big players though leaves private funds and "mom and pop" investors - sometimes quite literally - to put up the funding to help grow these businesses. "I've always felt there was good potential here," says Mrs Garrison. Mrs Garrison is not a professional investor, she manages real estate. But her experience with cannabis is personal. In 2004 she was diagnosed with Sjogren's syndrome, an autoimmune disease. She spent years taking prescription medications that failed to alleviate her pain before being introduced to medical marijuana, which she says treated her symptoms far better than anything else. The mother-and-son team say seeing the benefits firsthand convinced them of the industry's potential. Apart from funding her son's dream business Mrs Garrison says she's looking to make a small investment in another business -possibly one at the conference. When she does Mrs Garrison says she's prepared to invest $5,000 to $10,000. It can cost more than $1m to start a cannabis business in the US, according to the Marijuana Business Association. Licensing fees, equipment costs and rent are often the biggest charges and costs vary widely across states because of the different regulations. Finding the right business is often the hardest part for investors. "If they don't know to ask the right questions they might be in for a nasty surprise down the road," says Christopher Milenkevich of Gotham Cannabis Associates. Mr Milenkevich - whose company conducts due diligence for investors - says tax issues, cash management and licensing are all areas investors need to ask about before committing themselves. Many banks will not open accounts for marijuana companies because the bank could risk losing its federal charter. So any new business in this field needs a good cash management plan. Cannabis businesses are also ineligible for federal bankruptcy protection. So if the company fails investors are more likely to lose everything. "The sheer amount of knowledge you have to have to make legitimate investments is huge," says Rob Hunt of Tuatara Capital. His private equity firm is among the largest investors in the industry. It has stakes in companies dealing directly with marijuana, including country singer Willie Nelson's cannabis brand Willie's Reserve, and ancillary businesses such as those that extract THC (the major psychoactive component of marijuana). Mr Hunt spoke at the conference about what investors should look for in a company they are thinking of investing in. He got started in the cannabis industry in 2007, running and then selling his own business, Rocky Mountain Hydroponics. In 2014 he joined forces with three Wall Street veterans and set up Tuatara to capitalise on the industry's need for funding. Tuatara vets each of its investments for between seven and nine months and expects returns of 35%. Mr Hunt admits the business has benefitted from the absence of big players like pension funds. And he says by the time the laws are changed to allow those players in, Tuatara will be prepared to sell its shares for large profits. Steven Trenk is also taking advantage of the need for funds. He attended the conference in hope of finding new investment opportunities. His firm Lizada Capital already invests in 35 cannabis companies. When looking for an investment he says he focuses on the management. "This market is brand new in every respect [so] you need to look for people who can deal with that." Even at state level, regulation can make investing hard. Both Colorado and Washington - where cannabis is fully legal - have residency requirements for investors. To own part of a cannabis company in Washington you must live in the state for six months and in Colorado you must be a resident for two years. Loans, on the other hand, can be granted regardless of residency. "Companies like loans because it allows them to keep ownership," says Scott Jordan of Dynamic Alternative, which has helped cannabis companies borrow more than $15m. The lack of commercial credit has opened up opportunities for private lenders who want to step into the cannabis industry. The average loan is $750,000 and has a high interest rate because of the risks associated with the industry. For investors like Betty Garrison this may be a way to test the water before investing heavily in her son's company. The pair left the conference without any firm investment plans, but with a better sense of the hurdles and several leads. Seasoned insiders though warn new investors like Mrs Garrison that while the potential benefits may be great, there is also the possibility of your money going up in smoke.